The call window is the information and control centre for your phone calls. 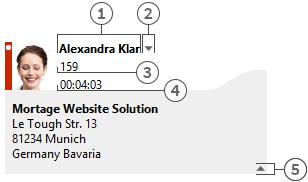 In addition to the visualisation of the call state, dialog partner and other relevant informations about the call, it is also possible to control the call. The window encapsulates logically connected phone calls in a single user interface and thus permits the convenient control of one or more calls on one phone. With the option of making assignments to projects, marking private calls and writing memos, this window is one of estos ProCall's central components. estos UCServer and estos ProCall search automatically for a contact for the phone number during a call. The contact found is displayed here if available. If no contact could be found you can create a new contact here. If several contacts are found for the current phone number, you can select a particular dialog partner by means of the contact selection. estos ProCall stores this selection and will show you this contact as your dialog partner the next time he calls again. Further information about searching for contacts in estos UCServer and ProCall can be found under contact search. One of the strengths of estos ProCall is the option of extending the call window with dynamic HTML content. You can show and hide the display of additional information with this button. A series of templates are available for displaying further information which you can adapt to your needs. 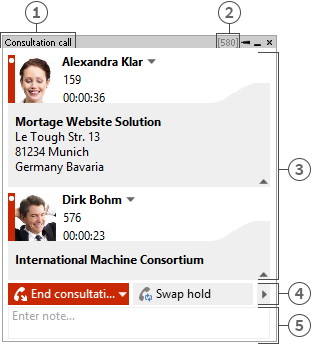 Is used in the call window to preprocess the details for a dialog partner on hold. 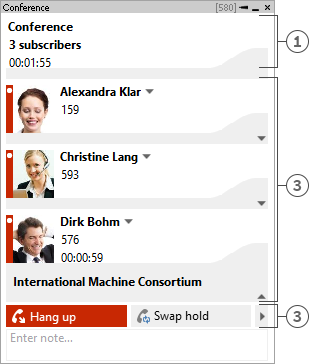 The partner on hold is displayed if a further estos ProCall user holds a subscriber while calling you. The template defines which contact details are displayed. Begin call recording. If call recording is set up on the server, you can thus start call recording which is sent to you as an e-mail after the end of the call. This is possible both with a dialog partner and a conference.